What exactly did the Fed do with Two Trillion Dollars ? To combat the financial crisis set off by the collapse of the housing bubble, the Federal Reserve Board has lent out more than $2tn through various special lending facilities. While the Fed discloses aggregate information on the loans made through each of the facilities, it will not disclose how much money it lent to specific banks or under what terms. By contrast, the Treasury puts this information about its $700bn TARP bailout up on its website. Partly in response to this huge increase in the Fed’s power (its secret lending is equal to two-thirds of the federal budget), more than 270 representatives in Congress have co-sponsored a bill that would have the Government Accountability Office audit the Fed. In principle, this audit would examine the Fed’s loans and report back to the relevant congressional committees, which could decide to make this information public. Most people might consider it perfectly reasonable to have Congress’s auditing arm review what the Fed has done with $2tn of the taxpayers’ money to ensure that everything is proper. After all, we wouldn’t let other government agencies spend one millionth of this amount ($2m) without some sort of record that could be verified. 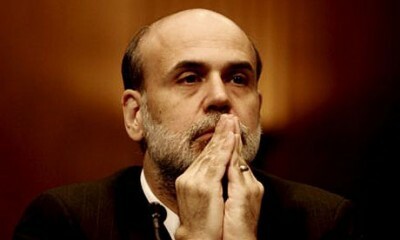 However, the Fed and its chairman Ben Bernanke, do not see it this way. Bernanke warned Congress last month that such an audit could jeopardise the Fed’s independence, which in turn, “could raise fears about future inflation, leading to higher long-term interest rates and reduced economic and financial stability”. OK, Bernanke warned Congress that if the Fed had less independence, it could lead to “reduced economic and financial stability.” We have just been through a year in which the Great Depression was a more frequent topic of conversation than the Superbowl, World Series, and Oscars combined. In fact, Bernanke is given credit for preventing another Great Depression. The Congressional Budget Office is now projecting that unemployment will average in the double digits throughout 2010 and it will not be until 2014 that the unemployment rate falls back to its normal level. Did Bernanke forget about the current state of the economy and the financial collapse that he was frantically trying to head off when he warned Congress that if the Fed were less independent, it could lead to “reduced economic and financial stability”? After all, how do you get less economic and financial stability than the Great Depression? This is not the first time that Bernanke’s memory appears to have failed him when addressing Congress about an important policy issue. Last September, when he was telling Congress that the economy would collapse if it did not approve the $700bn TARP bailout, he warned that the commercial paper market was shutting down. This was hugely important because most major companies rely on selling commercial paper to meet their payrolls and pay other routine bills. If they could not sell commercial paper, then millions of people would soon be laid off and the economy would collapse. What Bernanke apparently forgot to tell Congress is that the Fed has the authority to directly buy commercial paper from financial and non-financial companies. In other words, the Fed has the power to prevent the sort of economic collapse that Bernanke warned would happen if Congress did not quickly approve the TARP. In fact, Bernanke announced that the Fed would create a special lending facility to buy commercial paper the weekend after Congress voted to approve the TARP. Bernanke has taken extraordinary measures in the last year that have been successful in preventing a much worse downturn. Nonetheless, Congress should not forget that it was incredible mismanagement by Bernanke and his predecessor Alan Greenspan that brought about this disaster in the first place. If Bernanke is approved for another term, as seems likely, Congress should not hesitate to use more oversight than it did in past years. And, it certainly should not let the Fed send $2tn out the door without a verifiable paper trail. Given the track record for Bernanke’s version of bank independence, it is hard to imagine that greater congressional oversight would lead to worse outcomes.